An integral part of this Palestinian Islamization are the PA teachings that Islam is at ‎war with Jews. As cited above, the PA promotes hateful demonization and libels, which ‎it bolsters with religious teachings that depict Jews as Satan, monkeys, pigs and the ‎enemy of Allah. One poem that has become popular in the PA includes the words “our ‎enemy, Zion, is Satan with a tail." This poem has been recited by young children and ‎adults multiple times on PA TV. To support its teaching, the PA claims that Allah sent humanity a message through Islam’s prophet Muhammad that the killing ‎and extermination of Jews is a necessary step to bring the redemption. The murder of Jews is thus elevated by the PA as a holy act in the service ‎of Allah and humanity. Thus, according to PA religious teaching, the killing of Jews becomes a prerequisite for ‎the fulfillment of the Islamic ideal. This belief has had a significant impact on the ‎Palestinian population. In a 2011 poll conducted by the Israel Project, 73% of ‎Palestinians said they “believe” in the Hadith that preaches that it is Islamic destiny to ‎kill the Jews. "It's not enough for us to say: 'There are those carrying out Ribat' (religious conflict / war over land claimed to be Islamic). We must all carry out Ribat in the Al-Aqsa [Mosque]. It's not enough for us to say: 'The settlers have arrived [at the Mosque]'. They have come, and they must not come to the Sanctuary (i.e., Temple Mount). We have to prevent them, in any way whatsoever, from entering the Sanctuary. This is our Sanctuary, our Al-Aqsa and our Church [of the Holy Sepulchre]. They have no right to enter it. They have no right to defile it. We must prevent them. Let us stand before them with chests bared to protect our holy places." Israel is stigmatized as “an enemy” existing on Islamic land and fighting Israel is part of ‎a religious war for Islam. Palestinian youth are taught in school that their conflict with ‎Israel is "one of the greatest of the Ribat, and they [Palestinians] are worthy of a great ‎reward from Allah” and that Palestinians are “in Ribat until Resurrection." [Ibid, pp.86-‎‎87]. 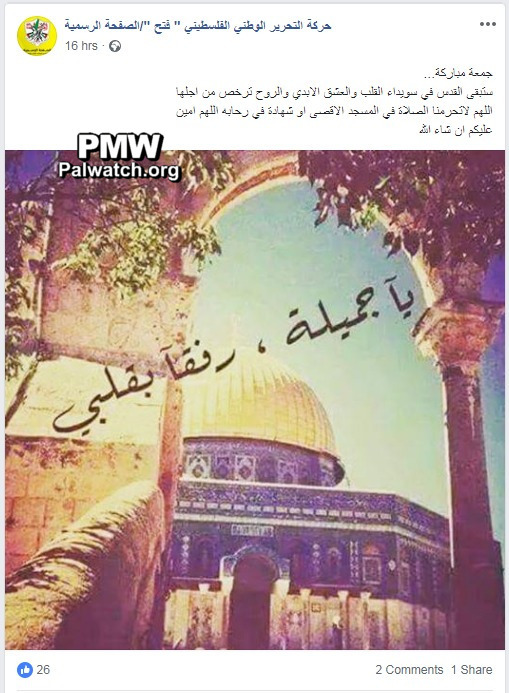 Post on Fatah Facebook page: "Jerusalem... for its sake our souls are insignificant. O Allah, do not prevent us from Martyrdom-death in its [Al-Aqsa's] plazas"
The image shows the Dome of the Rock. Headline: "Religious leaders again emphasized their support for the [PA] president before his petition to the UN"
"Supreme Shari’ah Judge of Palestine, [PA] President [Mahmoud Abbas’] advisor on Religious and Islamic Affairs, [and Chairman of the Supreme Council for Shari'ah Justice] Mahmoud Al-Habbash said that President Mahmoud Abbas will go to the UN in a few days accompanied by the support of a popular base that represents all the members of our people from the various monotheistic religions. He also noted that our people’s conflict with the occupation is a political conflict and not religious, as Israel is trying to market it to the world. Al-Habbash added at a press conference, which was held yesterday [Sept. 13, 2018] in the [PA] presidential headquarters in Ramallah after the president's meeting with a delegation of Palestinian religious leaders, that 'This group of religious leaders, which represents the [different] parts of the Palestinian people, comes to emphasize its commitment to the legitimate Palestinian leadership that is represented by the PLO, and their unity around this leadership, with President Mahmoud Abbas at its head.’"
· The PA and its leaders consider all of the Temple Mount an integral part of the Al-Aqsa Mosque. · Israel does not excavate under the Temple Mount. Headline: "Fatah and the prominent figures in Jerusalem are calling to come out and go up and carry out Ribat at the Al-Aqsa Mosque today"
"The Fatah Movement called on the prominent national figures in Jerusalem, the eternal capital of the State of Palestine, to go up to the Al-Aqsa Mosque and carry out Ribat (i.e., religious conflict/war over land claimed to be Islamic) there. This was in order to stand up against the calls from the sides of the 'herds' of extremist settlers this morning [July 22, 2018] to invade the Al-Aqsa Mosque and carry out Talmudic (i.e., Jewish) ceremonies in its plazas (Jews wanted to go up to the Temple Mount on that day due to the Jewish fast day of Tisha B'Av; see note below –Ed.)" Tisha B’Av - Jewish day of mourning commemorating the destruction of the First and Second Temples in Jerusalem (586 BCE and 70 CE) and the forced exile of most of the Jewish people from the land of Israel. "[Israeli] Minister of Agriculture and Rural Development in the occupation government Uri Ariel yesterday morning [July 8, 2018] invaded the blessed Al-Aqsa Mosque (i.e., the Temple Mount) at the head of a group of settlers, from the direction of the Dung Gate [of Jerusalem’s Old City]. Together with the settlers, the Israeli minister held provocative tours at the Al-Aqsa Mosque in traditional Talmudic (i.e., Jewish) garb… Official [PA] Government Spokesman Yusuf Al-Mahmoud said that the Israeli minister of agriculture's invasion of the blessed Al-Aqsa Mosque, the holiest site to the Arabs and Muslims, and his racist and occupation statements, go too far, create tension in our land, the region, and the world, and destroy all hope for peace... Al-Mahmoud added that the statements by Ariel – who from within the Al-Aqsa Mosque (sic., Jews who visit the Temple Mount do not enter the mosque itself) made an occupation c all with destructive Orientalist-colonialist roots to establish the alleged Temple in place of the Al-Aqsa Mosque… [PA] Minister of Religious Affairs Sheikh Yusuf Ida'is also condemned the Israeli minister of agriculture and Israeli Parliament Member [Sharren Haskel’s] invasion of the Al-Aqsa Mosque. Ida'is said that the renewal of these invasions is a dangerous escalation and an offense to the sensibilities of millions of Muslims, not only in Palestine but throughout the world… Supreme Shari’ah Judge and [PA] President [Mahmoud Abbas’] advisor on Religious and Islamic Affairs Mahmoud Al-Habbash also condemned the recurring invasions of the Al-Aqsa Mosque by extremist Jews, which are being led by the so-called 'Israeli minister of agriculture,' Uri Ariel...."